I was away overnight and surprised to see nothing about this here. 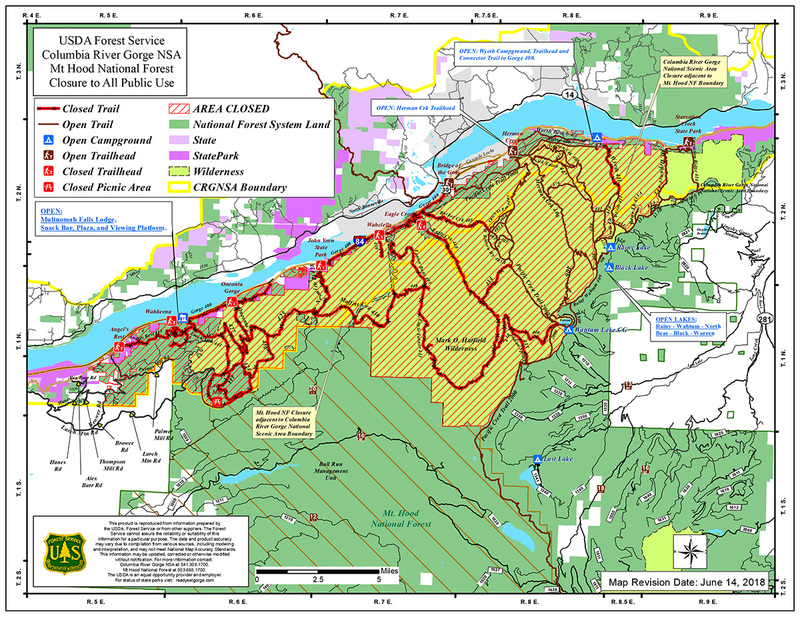 Looks like PCT and Benson Plateau and everything east - except Wyeth Trail - is now open. I wouldn't normally do a backpack there this time of year, better to go up higher because the snow is melting. Maybe I'll wait for fall. Up PCT, down Herman Creek Trail. Or Nick Eaton/Gorton Creek. Something like 30 miles. Note that only trails are open. Anything outside of 25 ft from the trail is still "closed." Did the first yesterday. It's in exceptional shape, except upper Herman which is quite overgrown in places. Let the parking wars begin! Actually, since they went to limiting the parking places with threat of fine, tow and imprisonment, parking has not been the problem it used to be. Actually, let me rephrase that: getting back down to the highway after the walk hasn't been the problem it used to be. Shall we place bets on who will be the first person to sneak down from Benson Plateau to Eagle Creek, or has that ship sailed and it's a question of who will get fined first. Perhaps that ship gone out to sea as well? I think the opening hasn't gotten a lot of notice. I parked for Herman Ck at 8:45 Sunday morning and the main lot was not full. There is a sign not to park on the approach road, so I'm guessing the road below will be the overflow, like in the old days when they used to lock the approach road in winter. I did a loop around BP and it was surprisingly unaffected, even Benson Way. Trip report later today. I would assume people would sneak down Eagle Creek itself from Wahtum Lake rather than from Benson Plateau, and presumably some already have, though we wouldn't know who. I think the opening hasn't gotten a lot of notice. The "PCT is closed" signs are still up at the Barlow Pass PCT trailhead/exit. The sign(s) state to catch a shuttle at Timberline to Stevenson or Bridge of the Gods, I can't remember which.